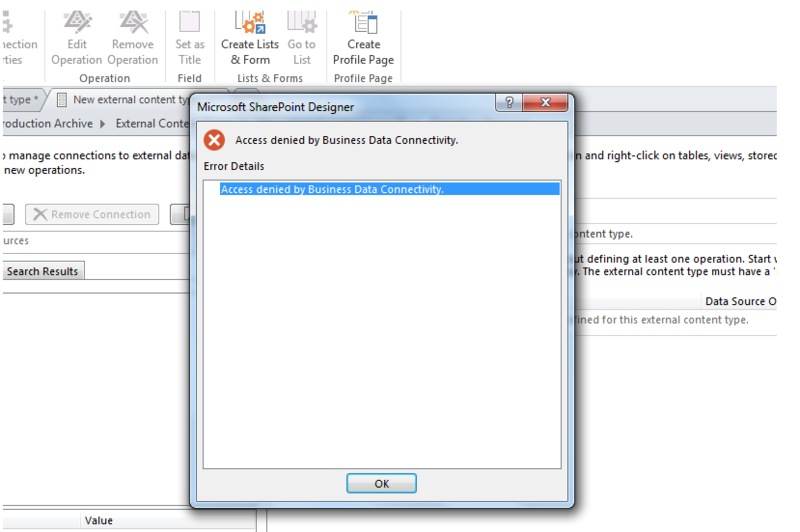 User is trying to create external content types using SQL Server, using sharepoint designer. I as an SharePoint Administrator i can login without any issue but this user who is dbo of remote sql server and is a site owner of the sharepoint site cant add connection is prompted with this error. Have anyone experienced such issue in past, please share your experiences. The user in question needs to be granted access to the BDC application. In Central Administration access BDC service, select the BDC application and then grant the user the expected permissions. Not the answer you're looking for? Browse other questions tagged 2013 bdc or ask your own question.